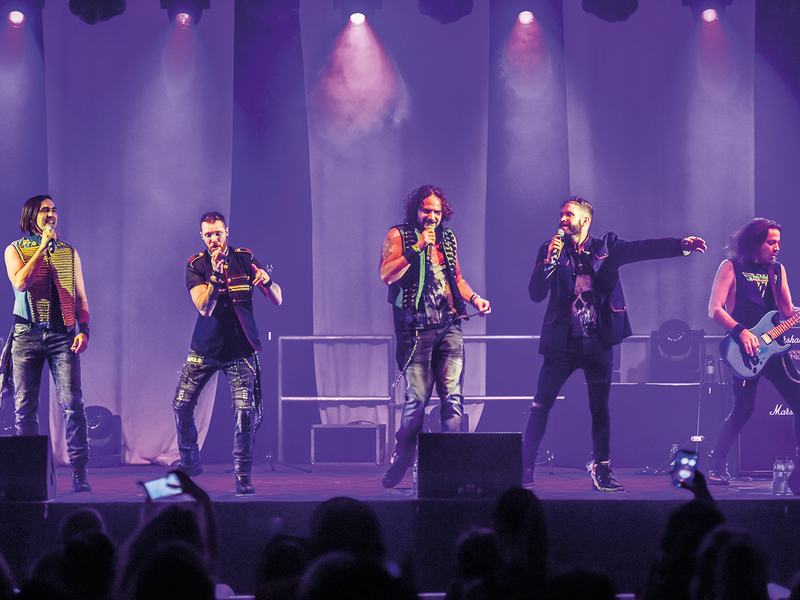 Little did we guess that we were in for one heck of an evening as Caesars Palace Bluewaters, JBR threw open its doors with a bang by showcasing one of the most entertaining music acts in the business, Tenors of Rock, at its dome-shaped entertainment venue, The Rotunda. The Tenors, five guys with amazing voices, gave us a timely reminder that good old fashioned rock ‘n’ roll is very much alive and kicking, even in this age of overblown digitally processed music. Caesar Bluewaters is an amazing venue and Wednesday’s opening act was pugnacious to the point of hitting you in the face as you grinned unabashedly up at those guys with the most amazing voices. It sounds crazy, but where in the world would you find songs like Queen’s monster hit ‘Bohemian Rhapsody,’ Guns ‘n’ Roses signature rocker ‘Sweet Child of Mine’ and Muse’s ‘Knights of Cydonia’ on the same set list. Tenors of Rock were formed in the UK with the aim of reinventing the everyday male vocal group and deliver a rock experience that leave you hungry for more. And boy did they create an impression on an adoring audience at The Rotunda, performing gems like AC/DC’s Highway to Hell and Bon Jovi’s Living On a Prayer. The Tenors, who wowed audiences at the world’s entertainment capital, Las Vegas, until making their way to Dubai, are David ‘Dai’ Richards, Jimmy Denning, Jonathan Williams, Tommy Sherlock and Dan Schumaan, the lone Aussie in the otherwise British outfit. Together they are explosive, fun and super talented. Small venues are intimate and allow for closer interaction between the act and audience and The Tenors exploited it to the brim with their constant banter and high-octane signing. It was sheer theatre. The energy level of the show had me drained and threatened to blow the roof off the newly-built Rotunda. After the concert I’m pretty sure that the builders sent in a crack team to check the if the ceiling was still in one piece and would strong enough to withstand the pounding from the band who will be performing at the venue for the next three weeks. The thing I really like about The Tenors was that they were clearly having so much fun on stage. Having said that most bands feel the same way too but you could sense that these guys were different from your average bands. The lighting was great and so was the sound. Nothing took away the spotlight from David Richards and the rest of the outfit. I, for one, loved the show and would love to go back to The Rotunda, that’s if The Tenors are still around. The Rotunda at Ceasers Palace, Bluewaters is housed in a distinctive circular dome inspired by Rome’s famous Pantheon, the intimate 500-seat-360-degree viewing venue is a temple to awe-inspiring live acts and immersive shows. Guests can expect an electrifying roster of legendary headliners, trendsetting theatre acts, mind-blowing magicians and hilarious comedians.